On 11 October 1932, the Chancery Building at 31 Mulberry St. was dedicated. The new building replaced the parochial school of St. John’s Church, which housed the Chancery office until the widening of Mulberry St. forced the Diocese to demolish it. At the dedication, a time capsule was placed inside the cornerstone of the building. 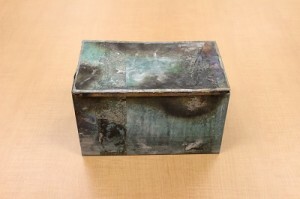 This time capsule was recovered in 2011, almost 80 years later. Inside, there was a collection of surprisingly well-preserved Diocesan artifacts and ephemera. Several news articles relating to the construction and dedication of the new Chancery building, as well as a four page letter detailing the history and circumstances of the Chancery building’s construction, provide context for the time capsule. The time capsule also contained a photograph of Bishop Thomas J. Walsh, who later became the first Archbishop of Newark when the Diocese was elevated to Archdiocese in 1937. 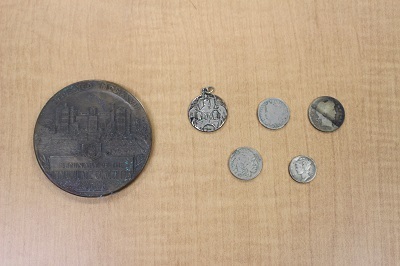 A 1927 medal depicting Immaculate Conception Seminary on one side and Bishop John J. O’Connor on the other was found in its own small case within the time capsule. Bishop O’Connor’s calling card was also enclosed in the case. In addition, there was a small collection of coins, including a Pius X medal, a 1907 quarter, a 1923 buffalo nickel, a 1925 Liberty dime, and a 1901 Liberty nickel. Lastly there were three stamps from 1932: a cancelled Washington stamp, 1¢; postage due stamp, 2¢; and a cancelled Washington stamp, 3¢. These materials provide a fascinating look back at the history of the Archdiocese of Newark. To learn more visit the Archdiocesan history and archives page, or the A&SCC page on Archdiocesan history.